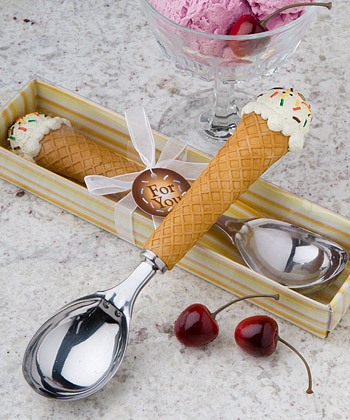 This festive ice cream cone favors scoop is one favor your guests will all scream for! Here's the scoop - everybody loves ice cream and they're definitely going to love these unique and useful favors! Each 7 ?" x 1 ?" 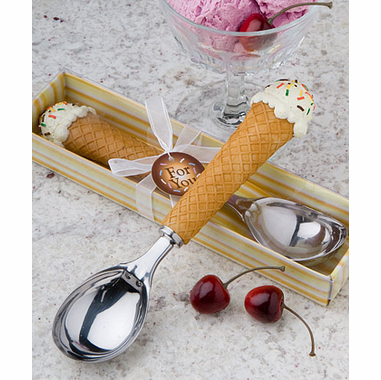 utensil favor from has a sturdy silver metal scoop with a poly resin vanilla ice cream cone themed handle, detailed with colorful sprinkles and a waffle cone design. Each comes delightfully packaged in a clear topped box with a yellow, brown and white striped base, tied with a white organza ribbon and an attached chocolate and sprinkles themed "For You" tag.